Here we will mark those fixed points in space and time where magic happens. It is 40 years since Graham Phillips and myself embarked on a psychically-charged historical quest to discover the first Meonia Sword and Green Stone, the story told in our books The Green Stone and The Seventh Sword. The incredible sequence of events surrounding this story led to the birth of psychic questing, the idea of using psychic abilities to discovery hidden artefacts, explore landscape mysteries, or solve historical enigmas. Psychic questing continues to thrive today, with people all the world embarking on their own quests of discovery. 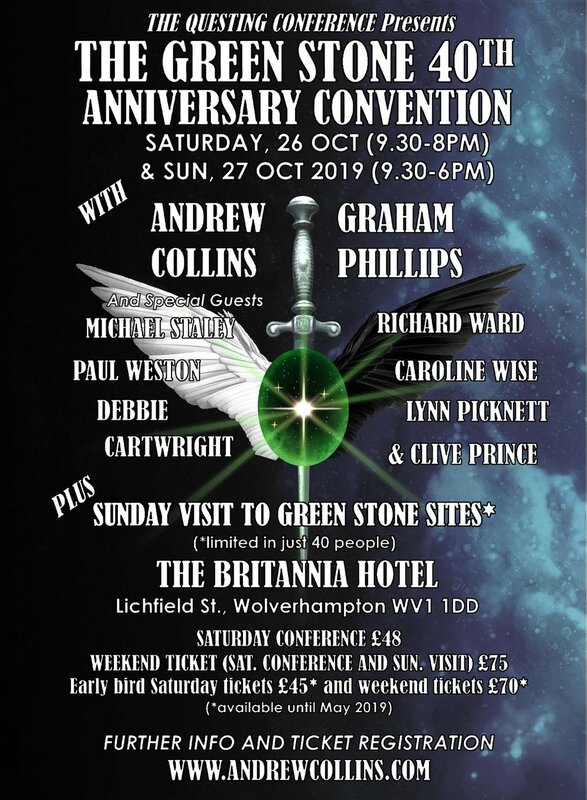 To celebrate the 40th anniversary of the pivotal Green Stone story Graham and I host a one-off conference convention to take on Saturday, 26th October this year at the Britannia Hotel, Wolverhampton. We will be joined by a number of special guests including Debbie Cartwright, Richard Ward, Michael Staley, Caroline Wise, Paul Weston, Lynn Picknett and Clive Prince. All will deliver talks about either psychic questing or historical cases that have involve psychic questing in some manner. Wolverhampton was chosen as a venue since it was here, in October 1979, that the Green Stone story was played out. On the Sunday of the event Graham and I will lead people around key sites involved in the Green Stone story including the Knights Pool, Swans Neck, and Dunstall Castle. Tickets for the event are GBP 45 for the Saturday conference, or GBP 70 for the entire weekend including the Green Stone site visit, which will take place on a hired coach. These are early bird prices. In May ticket prices will rise to GBP 48 for the Saturday and GBP 75 for the entire weekend. So secure your tickets now, as there are only 40 places available for the Sunday tour.